John Hoyland R. A. (1934-2011) trained at Sheffield College of Art (1951–6) and the Royal Academy Schools (1956–60). Under the influence of Nicholas de Staël he began by 1954 to paint Sheffield landscapes and abstractions from still-life subjects. His devotion to colour began with experiments at a Scarborough summer school (1957), where tuition was provided by Victor Pasmore among others. At the Situation exhibitions of 1960–61 he showed some of his earliest fully abstract paintings, in which he used bands of colour to explore perceptual effects such as the relationship of image to background or to create the illusion of buckling the picture-plane. This geometric character soon gave way to sinuous lines enclosing discs of colour, and eventually to a freer and more fluid application of paint. 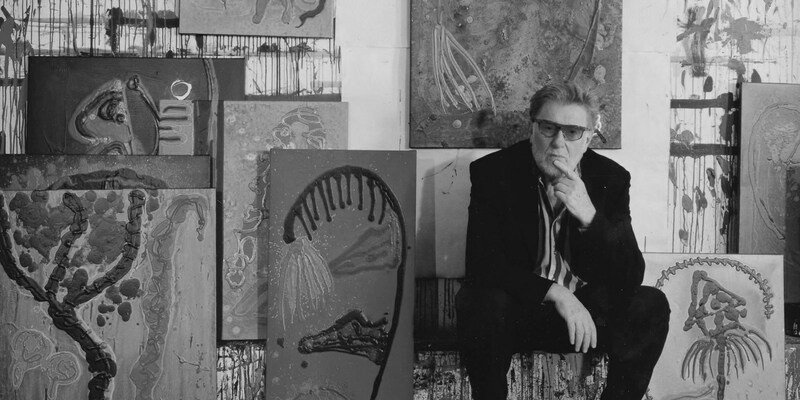 Hoyland's visit to New York in 1964 on a Peter Stuyvesant bursary brought him into contact with painters such as Helen Frankenthaler, Kenneth Noland and Jules Olitski and with the critic Clement Greenberg. Elements from these American developments, especially from colour field painting and Post-painterly Abstraction, feature prominently in subsequent canvases by Hoyland in the use of staining techniques and acrylic paint, the interaction of unmixed colours, and an emphasis on the material weight of paint. Despite these influences, however, Hoyland came to reject the American tendency to reductivism, concentrating in later paintings on the approach exemplified by Hofmann and de Staël, with varied and tactile paint surfaces and a disposition of blocks of different colours to create sensations of advancing and receding space.